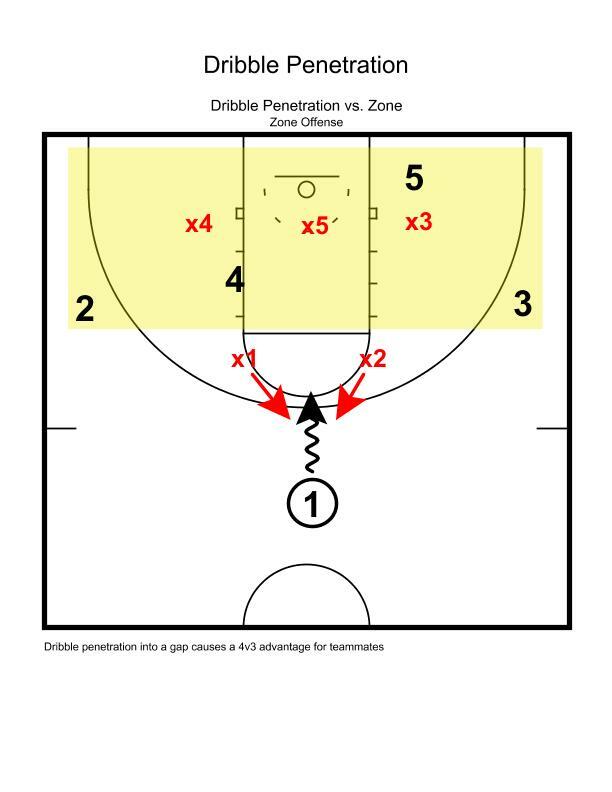 Tips for constructing a principle-based zone offense system that will raise the “Basketball IQ” of your players. In motion offense players are taught how to read defenders, cut, read screens and understand spacing. In short, they learn how to play and not how to run plays. Nothing raises the “Basketball IQ” of a player to a higher level than being well-schooled in the principles of motion offense. 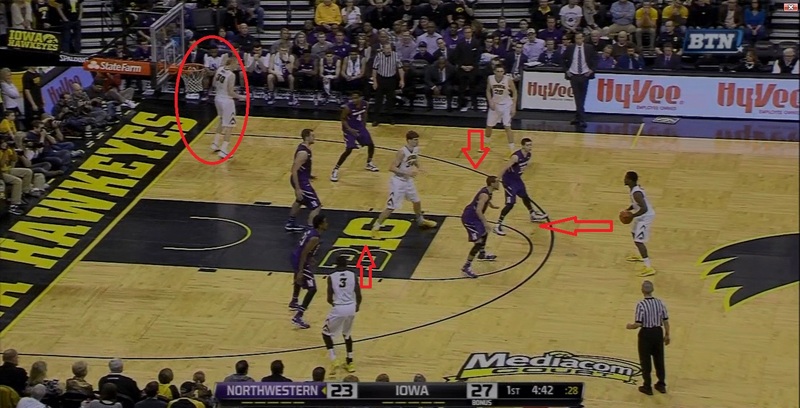 When facing a zone defense, offense should behave in much the same way. “Plays” are not as valuable as knowing how to play when your opponent employs a zone defense. Much like versus a man-to-man, a principle-based zone offense without fixed patterns or predetermined actions is highly effective. Players that have been taught concepts rather than “offenses” are adept at reading defenders and understanding the game. This carries over to zone offense. But what are the principles to teach and how do you impart that knowledge to your players? Let’s take a look at five concepts that should be taught while building a principle-based zone offense. Keep in mind that the best zone offenses employ all five of these principles at varying degrees with every possession. One of the first decisions a team must make when facing a zone is their initial alignment. Every zone defense has a shape and specific slides and coverages it uses to defend ball and player movement. Alignment can distort that shape and distorting the zone is a key to success. Some coaches use an “odd versus even and even versus odd” principle to guide them toward alignment. If the defense shows an odd numbered front (i.e. 1-3-1 or 1-2-2 zone) they answer with an even fronted offensive alignment. If the defense shows an even numbered front (i.e. 2-3 zone) they answer with an odd fronted offensive alignment. While this is sound, does it express the type of higher level understanding we want from our players? A coach recognizes the front and calls an offense, but do the players see it? 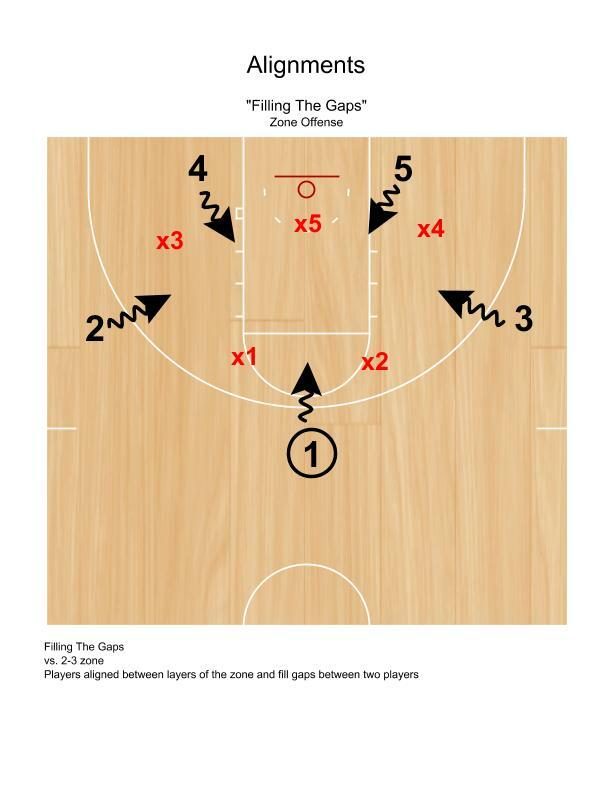 While accomplishing the same objective, teach players to “fill the gaps” versus a zone. Teaching players to fill the gaps will abide by the “odd/even” principle while requiring players to see the zone and understand its structure. Below you see Kansas filling the gaps versus the Texas 2-3 Zone. Players are located in a position to attack gaps and create distortion. These are some gap alignments versus various zones. 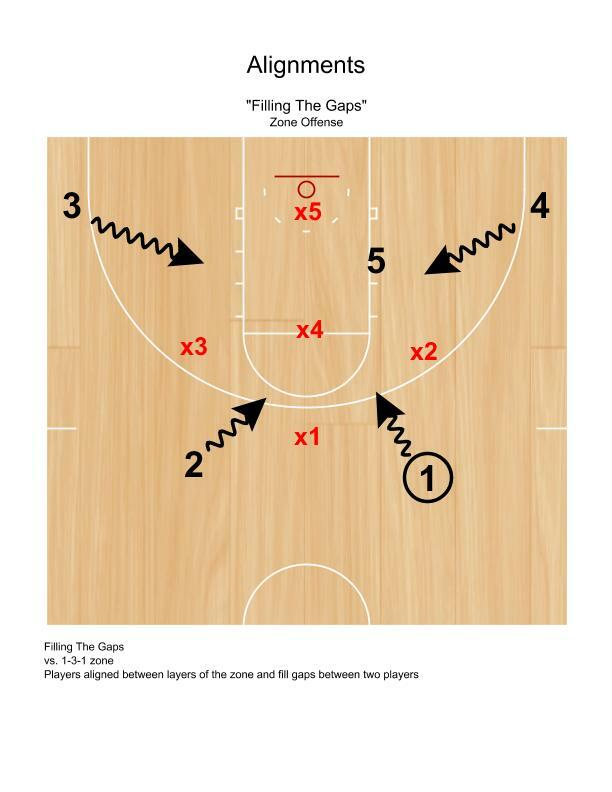 Against a 2-3 zone players align to split top and wing gaps. It is advantageous to station players behind the zone and to flash into gaps as well. Against a 1-3-1 filling the gaps creates a four-out alignment. This is in line with the “odd/even” concept, but teaching players to recognize the gaps rather than the front builds an attacking mindset. And they cannot be fooled because they are learning how the zone behaves. Against a 1-2-2 filling the gaps means lifting the wings above the dead corner. While it may be mere semantics to veer away from the “odd/even” language, filling the gaps creates alignments where offensive players can attack gaps between two defenders and cause ambiguity between pieces of the zone. Players will take control of their offensive alignment by recognizing these gaps and setting up accordingly. One principle to follow is to never let all five members and especially the back line of the zone to look ahead and see all five members of the offense. Keep at least one player positioned behind the zone at all times. This forces the back line to sink and opens gaps. If the entire zone defense can see all five opponents they can squeeze to a close that vulnerable high post area. Below, Texas is reluctant to defend the high post player because of the TCU player looming behind the zone. 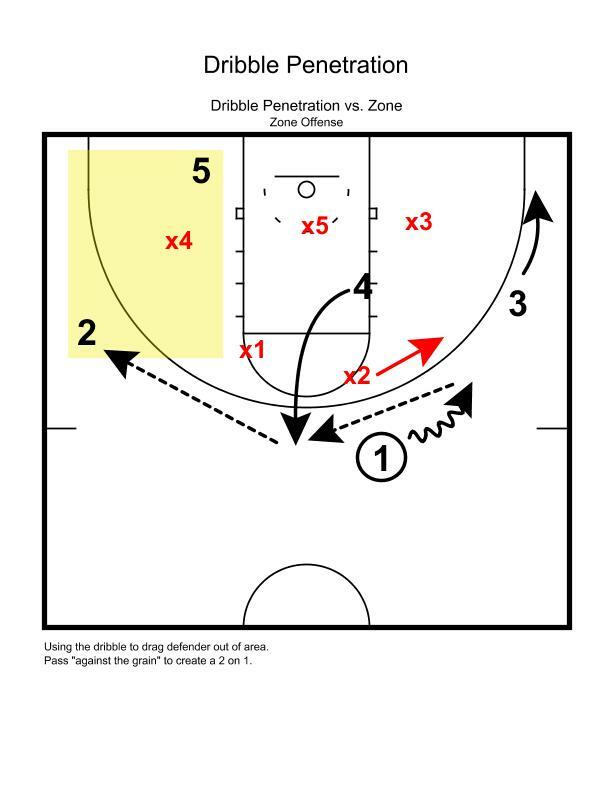 By presenting the back line of the zone with threats in front of them that they can see and coupling that with players working behind them that they cannot see, opportunities for lobs and high-low action present themselves. At times all five offensive players will be above the back line and your team should implement the concept of backing out of the zone. Usually a post player simply walks backwards and slides behind the back line of the zone. It may seem counterintuitive to suggest, but teams should use the dribble more freely versus a zone than a man-to-man defense. Driving the into the gaps of the zone can cause great distortion. Using the dribble to attack gaps draws two defenders to the ball and thus creates numbers advantages for other teammates. For example, attacking the gap at the top of a 2-3 zone creates a 4 vs. 3 situation. But using the dribble to attack gaps is not the only way the dribble is effective versus a zone. Using the dribble to “drag” defenders out of or to the very edge of their areas can cause great distortion of the zone. Dragging the defender out of their area and then passing “against the grain” can create great distortion and two-on-one situations for teammates. Using the dribble to attack defenders and gaps off of quick ball reversals and skip passes is yet another way to make the dribble work versus a zone. Upon the catch in these instances, use a shot fake then the dribble to attack long closeouts. Flashing players from the weakside into soft spots in the zone creates interior pressure on the defense. Instruct players to flash into the interior of the zone when the ball is opposite. Advise players to aim for “the bottom of the dots” (even though most courts do not have dotted circles anymore!) area when they flash. “Fit and sit” snugly between layers of the zone and, of course, exit or “back out” of the zone before the three-seconds violation. 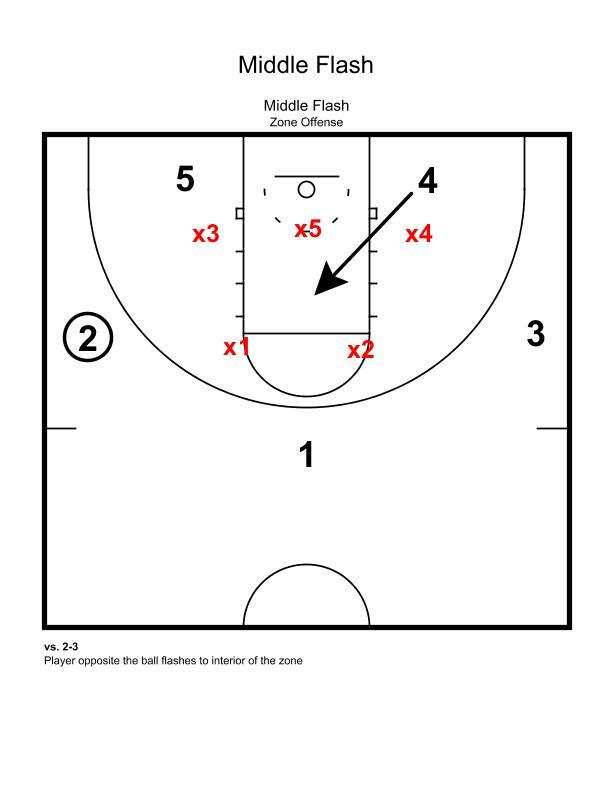 Below is an example of a middle flash versus a 2-3 zone. Filling the wing gap, short corner and midpost against the 2-3 creates an effective overload. 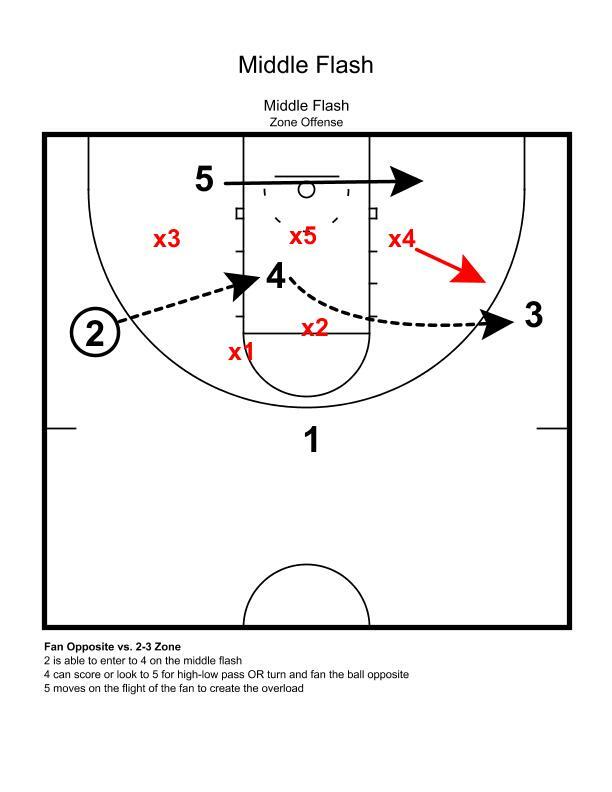 Below is an example of a weakside flash versus the 1-2-2 zone. Again, the player with the ball is filling the gap and the short corner and midpost are filled creating an overload. When a flashing player catches in that soft-spot area they can score or look high-low, but one action that is effective is for them to “fan” the ball opposite. 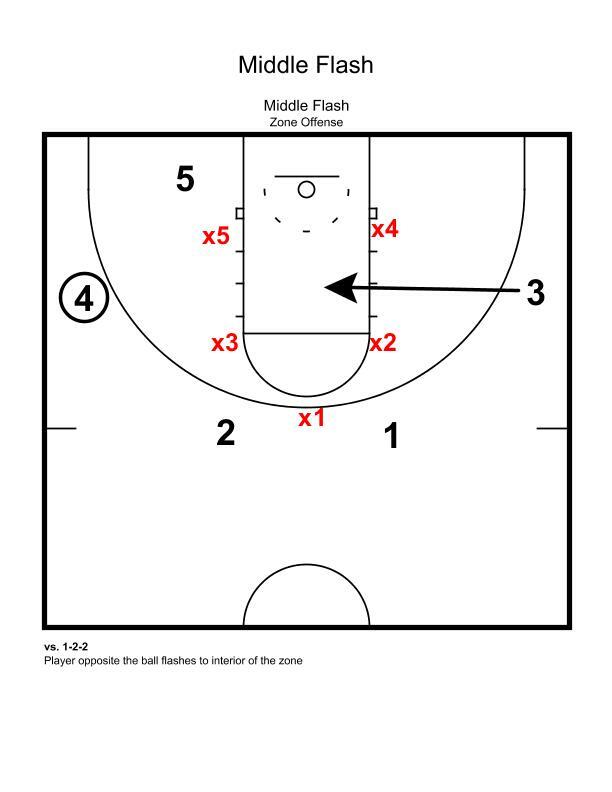 This action beautifully combines the principles of the middle flash and filling the gaps. Players can flash into the interior of the zone from high to low when the ball is on the baseline as well. Fitting players between layers of the zone forces the zone to contract to defend the interior and the ball going from inside to outside the zone forces the defense to expand again. The middle flash is a vital tool in expanding and contracting the zone. Usage of ball movement alone does not bother the zone. The zone can fairly easily slide as the ball moves pass-to-pass especially when passes are simply made to the next player. But coupling ball movement with dribble penetration and adding skip passes and reversals does bother the zone. Distort and reverse! 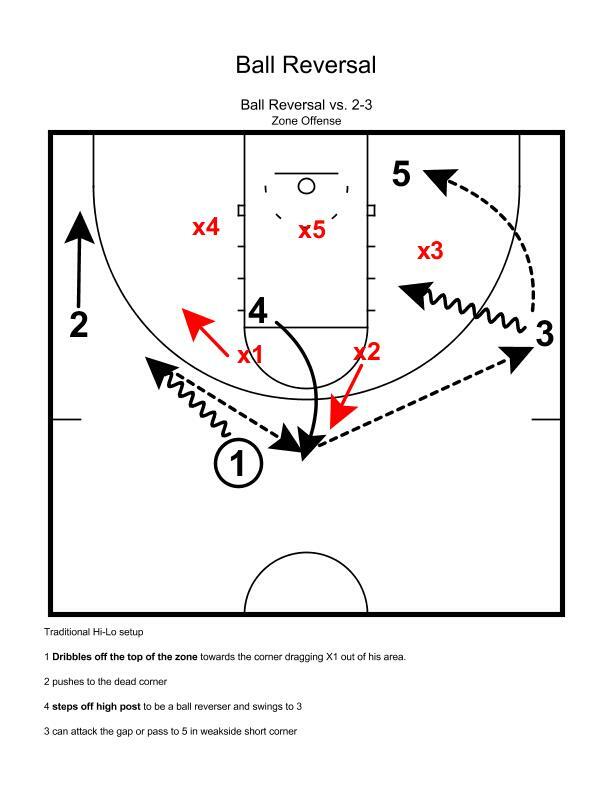 In the example below, 1 dribbles off the top and the high post (4) steps out to be a “pivot point.” 1 passes against the grain and the subsequent ball reversal creates a two-on-one on the weakside. Skip passes can be effective against a zone, but beware! Often teams “bait” offenses into skip passes and easily intercept them. Flare screening the zone can help with skip passes as well as faking passes before making a pass to set up the skip pass. Driving a gap then skipping can be effective as well. Generally, I prefer high post fans and “pivot point” reversals to skip passes, but when set up correctly, skip passes can put pressure on the zone as well. 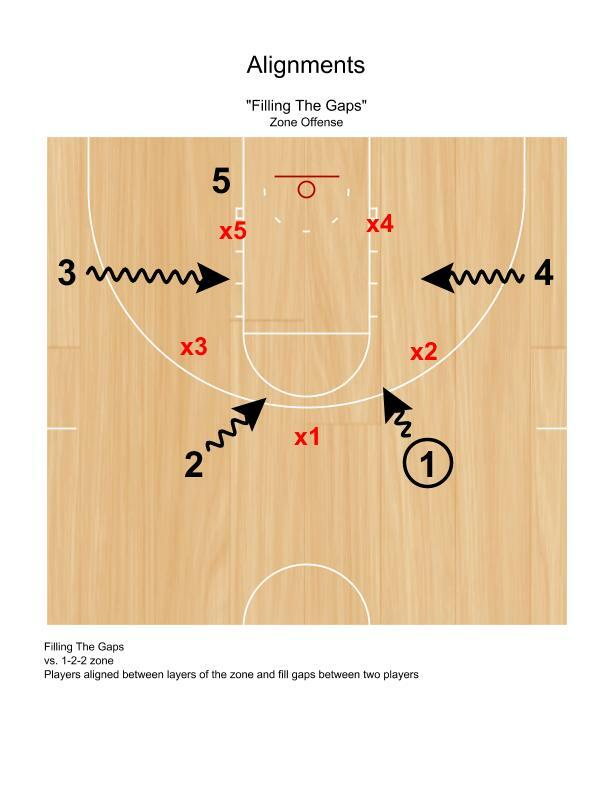 Attacking a gap with the dribble after catching the skip pass furthers good zone principles. Attack those closeouts, penetrate and contract the zone. Teaching these principles to players educates them on “how to play” versus a zone rather than simply calling a play or teaching a pattern and doing the thinking for your team. Teams well-schooled in the principles of motion offense versus a man-to-man typically grasp these zone principles quickly. These five principles should be combined within a given offensive possession to create a principle-based zone offense that your team can use to attack zones. Explore and use the Twitter hashtag #ZoneOffenseTips as well! Great summary of concepts. Thanks so much! great site you have. please put me on your motion offense emailing list.